The Black Lillies play their own unique brand of country, roots, rock and blues via Appalachia. Hailing from Knoxville Tennessee, they’ve grown from a few friends sitting around campfires and living rooms to a band that shows up in far-flung cities where folks know the words to the songs before the band hits town. 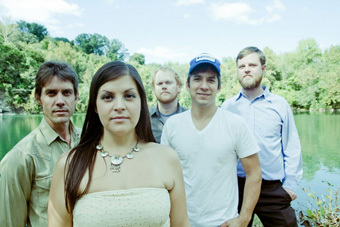 The band—Cruz Contreras on lead vocals, guitar, piano, mandolin, Trisha Gene Brady on vocals, guitar, ukulele, hand percussion, Tom Pryor on electric guitar, pedal steel, dobro, banjo, Jamie Cook on drums, and Robert Richards on bass—have played the Grand Ole Opry 15 times along with appearances at Bonnarroo, Pickathon, and on NPR’s Mountain Stage. Their latest album Runaway Freeway Blues, was praised by American Songwriter magazine for the band’s sweet vocal harmonies, road-weary lyrics, and inventive instrumentation. Don’t miss the Black Lillies when they pull off the highway to play the Freight.